An artist will drop 3,000 jewels down the stairs at the Hyde Park Art Center on Saturday. 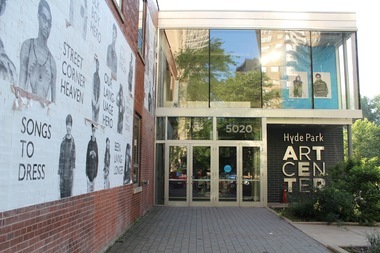 HYDE PARK — Visitors to the Hyde Park Art Center are about to find out what 3,000 jewels tumbling down a flight of stairs looks like. Artist Kara Cobb Johnson will drop 3,000 colored jewels down two flights of stairs at 11 a.m. Saturday at the art center, 5020 S. Cornell Ave.
Johnson will first give a tour of her work in the “Front and Center” exhibit of work by artists in the Center program. The drop will be filmed and documented for those unable to see the jewels fall in person. Starting at 1 p.m., Tina Tahir, another artist in the exhibit, will lead a workshop on methods for creating seamless repeating patterns. The events and the exhibit are free and open to the public. The “Front and Center” exhibit closes on Sunday.